This is (finally!) the debut album by Polish cellist / guitarist / composer Krzysztof LenczowskiFind albums by this artist, one of the most prominent representatives of the young generation of Polish musicians, who is characterized by a total cross-genre approach to music, tipping his fingers in anything from Pop, Rock, Fusion, Jazz and deep into contemporary Classical music, always with grace and sublime talent. The fact that this is his debut album, already preceded by dozens of albums recorded as a group member or sideman, is surprising, but on the other hand nothing about Lenczowski should be really surprising, as he is an Artist of the unexpected. 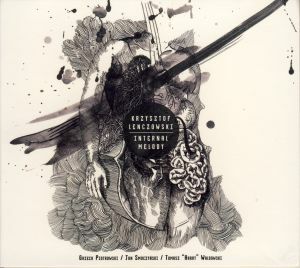 This album, recorded in a quartet setting with saxophonist Grzech PiotrowskiFind albums by this artist, organist Jan SmoczynskiFind albums by this artist and drummer Tomasz WaldowskiFind albums by this artist, was recorded at the Studio Tokarnia (owned by Smoczynski who also engineered the recording with the usual spectacular sonic results) presents eight original compositions, all by Lenczowski. From the very first tones heard on this album it becomes immediately apparent that this is a piece of music completely unique and incomparable to anything else happening anywhere. Yes, completely unexpected in every aspect: sound, melody, use of instruments, atmosphere and overall feel of this album are all absolutely stunning. Cello is by far not the most popular instrument outside of the Classical Music idiom and Lenczowski´s determination to stick with this instrument despite the obvious difficulty, is commendable. But the entire instrumentation of his music on this album is far from being easy on the ear: Jazzy saxophone playing complex extended solos, organ playing mostly bass lines and very limited melody / chord lines and a Rocky drummer on top – a strange recipe to say the least. And yet against all odds this music works splendidly and extremely effectively. Lenczowski´s cello parts are of course incredible all the way through, which is hardly surprising in his case. Surprisingly (again) Piotrowski plays beautifully and ambitiously as well, and Lenczowski´s decision to use him here turned out to be the right one, in spite of Piotrowski´s problematic flirts with Smooth muzak in the past. Smoczynski, as always, turns out to be an island of serenity and his somber, church like organ sound, creates a solid layer upon this music solidly rests, or floats above. Waldowski´s drums become an integral part of the ensemble and his sensitivity, elegance and coolness are exemplary. As usually the strength of the entire ensemble only works out if all the participants contribute on the same emotional level, which obviously happens in this case.